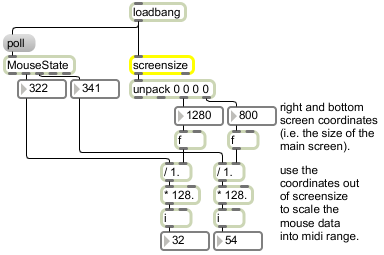 screensize reports the resolution to which the computer's monitor is currently set. Note: The Max 5 screensize object on Windows now behaves as it does on the Macintosh - it outputs the screen's size rather than its bounding coordinates. While this may cause off-by-one errors in patches that use the screensize object on Windows, fixing them will guarantee cross-platform compatibility for your patches. bang Triggers the output of the main screen size and total multi-monitor screen bounding rectangle out the outlets. list: Out left outlet: The bounding coordinates of the main screen: left is first, followed by top, right, and bottom. Out right outlet: The bounding coordinates of all monitors. If there is only one monitor, the output will be the same as with the left outlet.